When others say unkind things about people, what do you say? Love does not delight in evil but rejoices with the truth. It always protects, always trusts, always hopes, always perseveres. Love never fails (1 Corinthians 13:4-8). Have you ever heard anyone gossip about someone you know? "Well, I heard that she..."
"Oh, but didn't you know that he." Then all of a sudden it's your turn. What do you have to say? Here's what love says: Love covers a multitude of sins (1 Peter 4:8). Love doesn't expose. It doesn't gossip. If love says anything, it speaks words of protection. Do you know anyone who needs protection? Of course you do. Then give some. Pay a gas bill for a struggling elderly couple. Make sure your divorced friends are invited to parties. Promise your kids that, God being your helper, they will never know a hungry day or a homeless night. I tell you the truth, anything you did for even the least of my people here, you also did for me! (Matthew 25:4). Do you know anyone that needs protection? 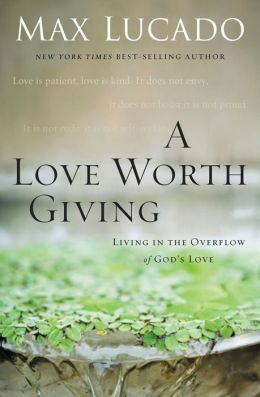 From Max's book, A Love Worth Living: Living in the Overflow of God's Love. © 2016 by Max Lucado. "What Love Says" by Max Lucado is licensed under a Creative Commons License. Heartlight encourages you to share this material with others in church bulletins, personal emails, and other non-commercial uses. Please see our Usage Guidelines for more information.